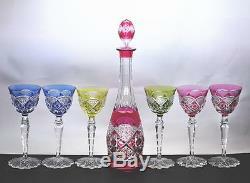 Val St Lambert Verrept Cased Cut Glass Decanter & 6 Wine Glasses Set. All are cut from cased glass which called Verrept pattern. And the foot of each wineglass are cut with a flower and a star pattern. The decanter and two wine glasses are cranberry color, two are cobalt blueand others are yellow green and light yellow green. They have the Val St Lambert mark at the bottom except two cobalt blue glasses. There are number of 21 at the bottom of the stopper and inside of the rim. It is an air bubble that above the rim number. CONDITION : The stopper of the decanter has the crack on the bottom. There are some scratches on the decanter bottom. (Some other minute scratches are there besides yellow arrows) The flaw near the mark is probably the factory error. Two cranberry wine glasses and cobalt blue one have a small chip on each foot. There may be chips elsewhere, but hardly sees it by the naked eye. The bowl and a stem of all wineglasses are very good condition. There are no chips, cracks or scratches. SIZE : Height: Decanter 40.8cm (16") Wine glasses 21.8cm(8-1/2")-22.1cm(8-11/16). If there is damage in the item, necessarily keep the all pieces including a minute parts. Do not throw away a cushion and the cardboard box either. Please keep the state when you received the item as much as possible. It include a duty when it backed to Japan (In case of it is required) Of course when there are big error on description, condition, size are not this policy. I can't understand English so well, but I'll answer a question carefully and promptly. The item "Val St Lambert Verrept Cased Cut Glass Decanter & 6 Wine Glasses Set" is in sale since Monday, February 01, 2016. This item is in the category "Pottery & Glass\Glass\Glassware\Cut Glass\Contemporary". The seller is "seizan21" and is located in Kamakura. This item can be shipped worldwide.